Indeed, there's something on the air tonight--RADIOLA! What's in the air could be Spring, music, or a bit of dread--or perhaps all three. I'll attempt to clear the air at 8 PM EDT on WHCL-FM. Here's the story of how Copyright went wrong (thanks to Rich Conaty). AL GALLODORO at the WATERVILLE PUBLIC LIBRARY FRIDAY! Al Gallodoro, the legendary reedman whom Jimmy Dorsey called "the best saxophone player who ever lived," will be playing with his quartet at 7 PM this Friday, March 23, at the Waterville Public Library (206 White Street, Waterville, NY 13480 Ph. 315 841-4651). Performing will be Al Gallodoro, sax, bass clarinet, clarinet; JoAnn Chmielowski, piano; Harry Aceto, Bass; and Dave Perazone, Drums. 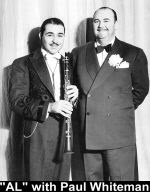 Al started playing professionally in 1926, and worked with such bandleaders as Isham Jones and Paul Whiteman through the 1930s. Today at 93, Al Gallodoro is still an incredible player. One of only 14 musicians and singers who recorded before 1940 and are still active (along with Svend Asmussen, Johnny Blowers, Lena Horne, Franz Jackson, Herb Jeffries, Lawrence Lucie, Buddy Morrow, Les Paul, George Shearing, Kay Starr, Gerald Wilson, Snooky Young and Zeke Zarchy), Gallodoro is still at 95% of his playing peak, playing phrases that sound completely impossible. Don't pass up this rare opportunity to hear Al Gallodoro play! Thanks mostly to this Copyright crackdown, online archives of Rich Conaty's "Big Broadcast" dating back to December 2001 have been removed from the server. That's five years of great programs of salubrious, lovely 20s and 30s pop and jazz gone for--what? So the ravening RIAA/ASCAP ghouls at SoundExchange can throw their weight around? The whole purpose of this equine feces is to actively suppress our cultural heritage and prevent priceless music from being heard. (And there is no price that can be put on it.) It truly and utterly micturates me off. By that token, I'd advise all readers of this blog to download all my RADIOLA! programs HERE before the jackals get around to killing that archive as well. Those old shows will be all you have after the Copyright Police chase me off Live365. UPDATE: Congress is likely to sit on its hands. Why did we elect these dorks? I don't normally like to use this page for polemical essays, but I think this matter is something that concerns anyone who listens to and relies on internet radio. The Copyright Royalty Board has announced its plan to raise internet royalty rates--charging internet broadcasters on a per-song, per-listener basis. And these charges will be retroactive through the beginning of last year. This will effectively shut down all programs like RADIOLA! that operate on a tiny (or nonexistent) budget. What is astonishing--and to my mind unjust--is that 80-year-old recordings should be subject to copyright control at all. The even more appalling fact is that all sound recordings will be kept from the Public Domain until the year 2067. Certainly no artists who recorded in the 1910s and 1920s--and very few who recorded in the 1930s--are in any position to enjoy their royalty payments. The main result of this quirk of the law is to actively suppress the music that we love. This music clearly belongs in the Public Domain. It is not only a major part of our cultural heritage, it should enrich and inform new music as it emerges. If it utterly disappears, music will wither and become even more banal than it is now. Imagine putting Beethoven or Schubert back under copyright. What would that serve? Similarly, what purpose does it serve (besides enriching the vampires in the moribund music industry) to suppress the music of 80 years ago--music that is vital to our national culture? I have no problem with living performers and composers demanding some measure of compensation. Yet it has been my experience that many artists are happy just to have their music promoted so they can sell recordings and get people out to their concert venues. Such avenues of exposure would be closed to the less well known and new performers as the self-referential dreck offered on radios throughout the land would prevail. I've loved the music of the 1920s and 1930s since I was a child, once I was lucky enough to discover its existence. Everyone thought I was weird for loving it, but I knew it was best for me. It wasn't a matter of nostalgia, or of longing for some other time. The music was simply excellent, and better than anything else available to me. I have to assume that a certain percentage of people are similarly moved, or would be if they had access to these recordings. Rather than being sequestered in a vault somewhere, or on the dusty shelves of a few record collectors, they should be freely broadcast so that they find their audience. And I have a suspicion that their audience would be immense if they were widely available. They shimmer with wit and levity, brim with deep joy, and beat with the pulse of life. And charging admission to them enriches no one except those who would keep them quiet so they can push today's mediocre crud as the real deal. This may be a lost cause, but those are always the ones worth fighting for. Write your representative in Congress to change this wretched state of affairs, and urge for the repeal of the horrid DMCA itself. There are now so many important matters before Congress (such as the war and civil liberties) that Internet Radio seems minor in comparison. Nonetheless, it is important, personally, to millions--and the death of independent online music stations would make our already bleak lives that much more dreary. Yes, RADIOLA! will go on--as a radio program. Those who want to hear it will have to stream WHCL on Friday nights (Hamilton College can afford the absurdly high fees) or move to the Utica, NY area and try to pick up the 320 watt station on their FM radios. (That's assuming there's no sporting event and the station is even on the air, which it frequently isn't.) And I'll try to hang in there on Live365 as long as possible. But when the RIAA types start pounding on my door, I'm not going into hock over this--not that I have anything worth pawning. Owing to some weather anomalies, I didn't even know if I was going to do a program tonight. This is one of those "The Dog Ate My Playlist" shows, but it features mostly CDs that I have recently acquired. RADIOLA! begins at 8 PM ET on WHCL, but I'll be in the studio from 7 to play some classic Jean Shepherd for those who might be interested.